Sustainability is rapidly becoming a guiding principle in modern food production, particularly in the area of sushi delivery. This is the result of reckless, unregulated and unreported fishing practices which have caused a sharp decline in fish populations and the endangerment of countless marine eco-systems. In response, a growing number of sushi chefs and establishments are now recognising the importance of sustainability and go to great lengths in integrating more ethical practices in the sourcing of their ingredients. At YouMeSushi, we are no different and recognise the importance of sustainable fishing techniques, not only to the future of the industry, but for the health and well-being of our customers. We employ a number of methods to ensure that fishing practices don’t harm the marine ecosystems from which our fish is harvested. Here’s some information about some of the measures we have in place to ensure sustainability. Many of the sushi delivery establishments in London import ingredients from Asia and other overseas destinations, failing to take advantage of local produce and ingredients. This dramatically increases transit time, especially when ingredients are stored in warehouses to await distribution. As a result, many healthy nutrients are lost during transportation. Because of this, YouMeSushi takes great care in making sure that all ingredients are sourced locally, thereby ensuring freshness, reducing our carbon footprint and avoiding the destructive fishing practices that are more prevalent in international waters. We’re also very familiar with its suppliers and will be able to tell you exactly where your fish was sourced and how it was caught. Industrialisation of the fishing industry and an ever-increasing demand is one of the main causes of these unethical practices and techniques. One of the most damaging is mass over-fishing. This has become increasingly prevalent in the past 50 years with an estimated 30% of the world’s fisheries hopelessly over-exploited. Other techniques such as bottom-trawling are also having a detrimental effect. This is one of the most harmful methods and involves the use of huge nets weighed down with ballast which are dragged along the sea-floor. This results in the dredging of fragile marine eco-systems which in turn causes by-catch (where endangered species or young fish are caught unintentionally). In most cases, these are just thrown back into the ocean, even though they often account for between 80% and 90% of the total yield. Millions of tons of by-catch are deposited back in the ocean each year. The seabed can also get churned up by the nets, creating turbid water that is inhospitable to marine-life. Sadly, this remains common, particularly with industrial boats on the high-seas. In an effort to combat this, YouMeSushi only works with fisheries harvested at a sustainable rate and which abide by the most stringent fishing regulations. These methods help to ensure the maintenance of the local fish population, minimise by-catch and prevent damage to our oceans. Endangered marine-life such as Blue Fin Tuna is also avoided in favour of environmentally friendly species such as the Yellow Fin. By working with well-managed fisheries and outlets, we are also helping to preserve local ecosystems while contributing to fishing communities that are threatened by unscrupulous fishing practices. 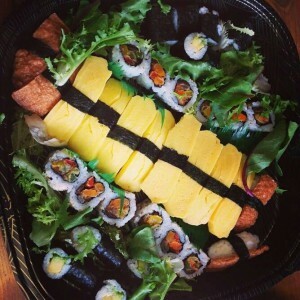 Many businesses specialising in sushi delivery in London, use packaging which contains oils and plastics. These can of course be very bad for the environment because they can’t be broken down adequately. So we make sure that all our home delivery sushi packaging is biodegradable so that they break-down naturally and degrade much faster. It should also be noted that Sushi production, although criticised by some as being harmful to marine-life, is evolving rapidly. Researchers are finding excellent new alternatives to the more traditional ingredients which have to be imported from the far-east. In Norway for example, scientists have found that the brown micro-algae, Badderlocks, closely resembles the flavour of Wakame – an integral ingredient in sushi. If cultivated properly, this could help to reduce the need for lengthy transportation and satisfy demands for ‘locally-sourced’ produce. This evolution in the Sushi industry, coupled with efforts to use only sustainable ingredients should go a long way in protecting its future without compromising our environment. So when you order from us, you can feel assured that every effort has been made to ensure that the ingredients on your plate are sourced from companies who use the most ethical practices possible.